St Bartholomew’s Hospital (Barts) is the oldest hospital in London, having been founded in 1123, and the oldest in the United Kingdom that still occupies its original site. 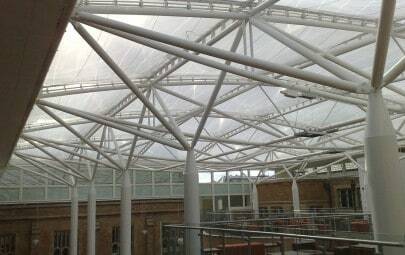 As part of a dramatic extension to the hospital, Architen Landrell were requested to design, manufacture and install a lightweight bright and airy roof offering 405 sqm of coverage over the triangular courtyard where the new buildings meet. Working with architectural firm HOK and Skanska, the solution that ticked all the boxes for Barts was a triple layer ETFE System with Intelligent Printing. At 1% the weight of glass, ETFE is an economical and environmental design solution that offers greater flexibility than glass. Intelligent Printing uses a complex control system and three layers of ETFE foils. The top and middle layers are printed through a process called Fritting. The print pattern on the foils is a checker board type design. 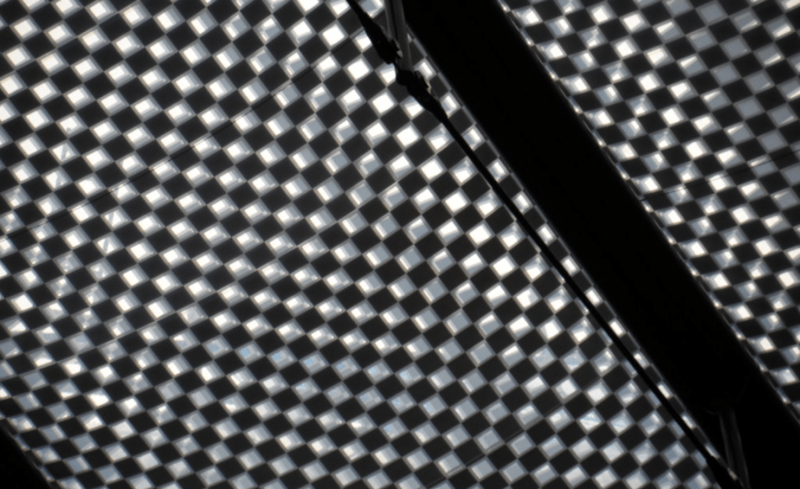 The top layer of the foil is offset from the middle layer and as air pressure is added to the top chamber, the foils separate and the middle layer lowers, allowing light to pass through the space between the printed patterns. 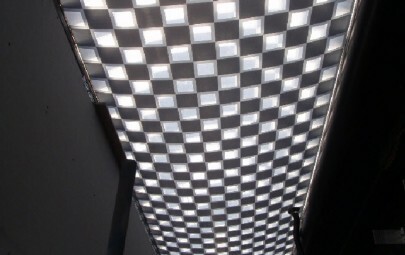 When air pressure is added to the lower chamber, the squares come together, reducing the light transmission into the building. During the evening, large interior uplights flood the atrium with light. Barts was concerned about light pollution from the building and wanted the ability to limit it. They were also concerned about the amount of direct sunlight on bright days. 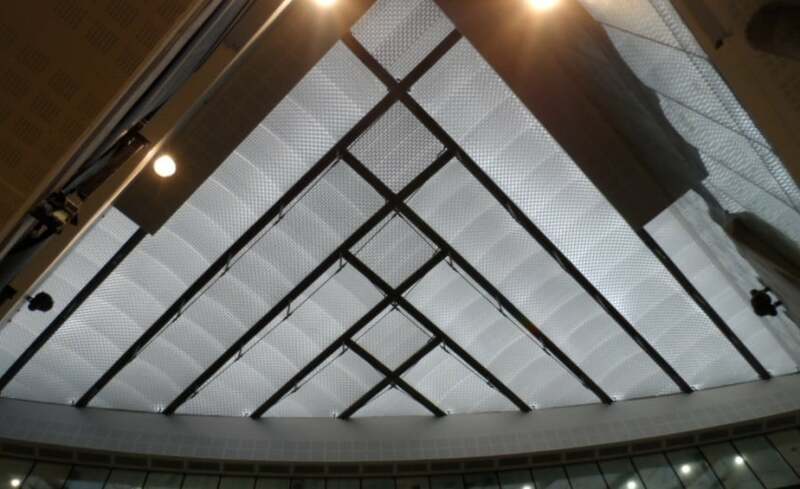 Intelligent Printing was chosen because it can effectively control and manage light levels in the atrium. Architen installed light sensors on the roof of one of the buildings. These sensors talk to the Building Control System and tell the Air Handling Unit for the ETFE system which chamber to inflate. The system is incredibly smart and can be programmed to maintain set light levels, both day and night. 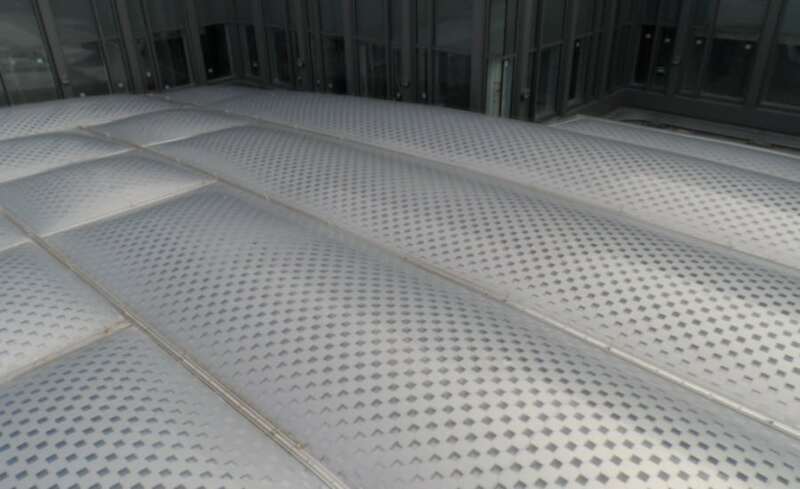 ETFE cushions are continually inflated by the Air Handling Unit from which air pipes run to each individual cushion. As the cushions only need to maintain pressure and not generate air flow, the energy consumption used by the unit is minimal. The system is so efficient that it consumes less energy than running a 100w light bulb. Two of the foil cushions were installed with sensors to monitor the pressure in the foils. This allows the air handling unit to adjust based on external factors such as wind, rain and snow. Architen designed and installed a substantial steel framework of beams over the atrium, bolted to the adjacent buildings. This fully engineered framework supports the long spans of ETFE air filled foils. Working over the top of a six story atrium has its challenges. To ensure safety of our installers and those working on the ground, we installed a SpanSet Walkabout System. This system creates a floating working platform across the open courtyard of the building. 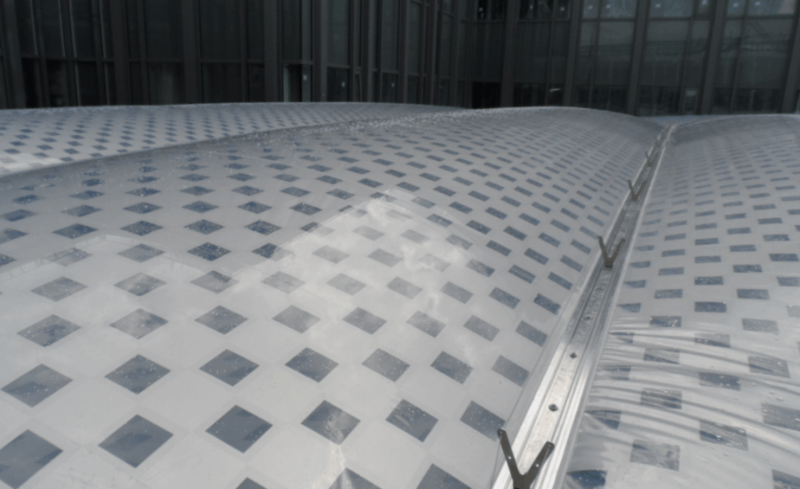 This temporary platform allowed our installation team to install the ETFE foils and connect the air handling units piping to the various sections of the foils with greater ease. 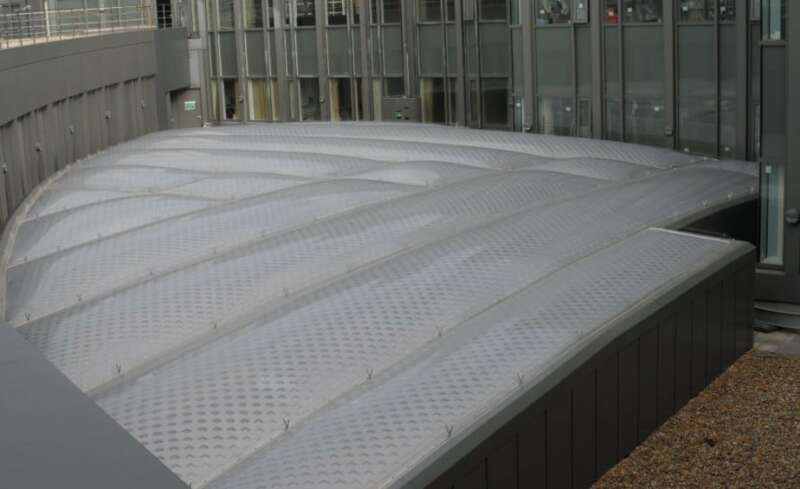 We are pleased to have completed another project with ETFE. 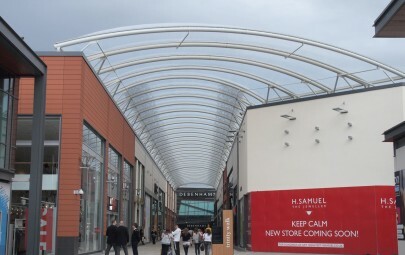 With over 30 years in the tensile fabric industry, Architen Landrell have mastered designing, manufacturing and installing ETFE systems. Not only do we fabricate the foils, we also build and engineer the Air Handling Units. This allows us to offer impeccable after sales care and stand behind all elements of our products. Should something ever go wrong (through an act of nature or an accident), we can quickly diagnose and respond.